I've 2 bandit angels in quarantine tank. One of the bandit show signs of fluke, which I then administer Prazipro through the recommended dosage. After 4 days there were still showing symptoms of fluke. I then did a major water change and administered the second dosage. (75% of the recommended dosage). Immediately 1 day after the second treatment, One of the bandit ceased to eat, however, still showed interest in the food. This got me worried and I did another major water change. The other bandit is still eating like a pig. Did the treatment caused one of the bandit to cease eating? How Long later should I begin to worry if the bandit continue not to accept prepared food. Both were eating fine prior to treatment. Is it normal for Prazipro to suppress the appetite of the angel fish? What will be my next course of action, if any. Thank you for the reply. through observation earlier, the bandit is still yawning/twitching. I'm assuming the 2nd dose of Prazipro would've knocked most of the flukes off and the bandit may just be irritated by it. Given that I've done two dosage of Prazipro, will it be too early to commence the dip now/soon? The fish seems very interested in food but just wouldn't swallow them down. Also, could it be a possibility that there may be an ulcer/growth inside the mouth (since I've caught him yawning several times)? If this is the case, will dip still be the way to go or alternatively can I perform Mxyazin treatment for 5 days. perhaps was the double dosage of Prazi. Fish started eating again less than an hour after dip. It's gobbling down nls pallets. Thank you!!! A week or two ago I had emailed you about my continuous issue with keeping angelfish. Well after all my other fish were doing great, I decided to pick up a blue face angel (4 inches) and a 5 inch French angel. They were voracious eaters the first week, everything from PE Mysis, clam, krill, Nori, spectrum pellets and squid. Well the last two days, each one of these angel fish has one cloudy eye. If I look super close at the eye, I can see little objects on eye that look like miniature contact lenses. I am almost positive this is eye flukes (Neobenedenia?). I am also pretty sure this is what took over on my previous angelfish I have had. I did a PH, temp adjusted freshwater dip, for about 8 minutes, but it appears that wasn't enough. 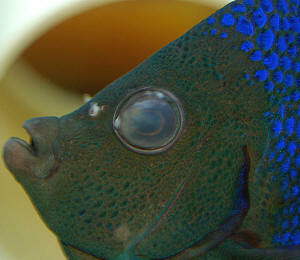 Rather than lose a now 3rd batch of expensive angelfish, I am contemplating using Prazi pro on the tank. From what I have read, people have used it in reef tanks safely, and this is a fish only tank. My question is, I just started using bio pellets about 2 weeks ago to help nitrates. Occasionally since using them, I have gotten mild bacterial blooms, where my ph fell from 7.9 to 7.7 (most likely due to oxygen being used by bacteria). The Prazi says to turn skimmer off, however, I feel I need that, certainly now for increased oxygen. Do you think I can leave skimmer on, and to just take cup off to allow bubbling water to return to sump? Typically before I email you anything, I spend at least two days reading WWM and other various sources. I then think hard and through, and if I still am left guessing, that is when I break out the email. I see in most cases, with one cloudy eye, it is best left alone, and to improve on its own. I would love to do that, but my recent track history shows these fish succumb to whatever it is in my tank, rather than improve. Perhaps I am just no good at keeping angelfish. So this was more of me reading on RC, TRT, etc, of people experiencing the same issue, using Prazi, and happy with the results. In hindsight, I strongly regret acquiring these fish. If my lfs would even take them back for free, let along, say 10 percent store credit, I would jump all over that. But he doesn't, so I want to try and make it work. All said and done, I feel this is my best plan. However, with the implementation of the bio pellets, that I felt would help me long term, I know am having some bacterial blooms, which rob o2 levels. The thing I am unsure of what to do is, leaving skimmer on, just pouring out of neck, to ensure better o2 levels. turned them on this morning. Thanks again, sorry for the frustration. I will leave skimmer on, just open the gate valve wide open and have it circulate back into sump. Once in, how long before the flukes start to pop off would you guess? If a few days (day, hours?) go by, and they are still there, than would it be safe to assume the cause is not flukes, or perhaps the product is defective? Ok, so it has been two days since I have placed Prazi pro in there, and whatever I was seeing on the eyes is stills there. Perhaps what I am seeing now is just the damage/scarring of the fluke being on the eye? of a 7.78. Is that considered danger zone? I bought two angelfish last week and they are in quarantine. They are a scribbled angel, and Koran angel, both 4-5 inch size area. The quarantine is a basic 40b tank, with HOB filter, maxi jet powerhead for aeration, and a heater. I keep the tank around 80, and SG is 1.021. I do water changes every 3 days, however have yet to see any ammonia or nitrite. I am using Cupramine at a .5 level as recommended. I plan on doing this 28 days, followed by some Prazi. I am new to quarantining and am looking to perfect my methodology. 2 things I have notice thus far, is the scribbled angel now seems to have some cloudiness in his/her eyes. Not totally clouded, but getting there, and it did not come this way. Could this be an adverse reaction from the copper treatment? Could it be flukes, or would that just be a white spec, and not cloud the entire eye? Secondly, the Koran angel looks like what appears to be flukes nears his gills. Literally two, just two pieces of what I can describe as big salt granules. I thought they were flukes, freshwater dipped in aerated RO water, for 5 minutes, and these did not fall off. I have scoured WWB <M?> and ReefCentral, but did not find anything remotely specific. My first inclination is to lower copper level via water change. I am also thinking of dipping the scribbled to see if that helps eye condition. Could also be a secondary fungal or bacterial, in which case I would think Prazi would help when I use that in a couple weeks. <Likely shipping damage (net scrape), stress in general AND Cu exposure. Ultimately I have a feeling of what to do, but would like some oversight. It is me again. My angelfish is infested with Ick. I can't dose any copper or medication because of the Japanese Dragon eel in there. What can I do? Please advice me. Thank You. Re: Japanese Dragon Eel and clown trigger. My angelfish have no Ick as mention previously. In fact they are flukes instead. So I am going to treat it with Praziquantel. Can dragon eels withstand this medication? I know you've heard this a lot, but I have to compliment you all on a fantastic site. I use the information on a very frequent basis, but as is human nature, sometimes I still learn things the hard way, however your advice has saved me from myself more than once. . Onto the fishy business: I have an angel that the LFS claimed was a juvenile 6 line angel. The angel was in a 10 gallon bare quarantine tank for 2 weeks, and all appeared well before I moved it to the main tank. While acclimating it to the water in the main tank I gave it a Methylene blue treatment for about 20 minutes, just as a precaution. The angel was ok for he first couple of days then I notices some patches on the rear section of it's body. I thought it might have been irritation from rubbing against the numerous Vermetid worms in the tank, the spots on the body seemed to clear up, but now it has several spots that I can only describe as looking like cysts. these look like little egg pouches or something. I have looked at a lot (not all) of the information from the WWM pages, and have not encountered anything that fits this description. I do believe it is some type of parasite, but so far (I don't think it's going to stay this way) none of the other fish are showing any signs of infection. I've attached some photo's to help identify the ailment, and maybe confirm the fish's identity as well. the fish too. Let me know if any of the pictures need to be clearer, sometimes the picture compression process does things to the image quality. I know that I probably should get this little one into a hospital tank, but I haven't had time to try to get him out. My experience is that I need to practically tear the tank apart to get a fish out, if there's one piece of live rock left in the tank, all the fish will find a way to hide under it. By the time a fish is easy to catch it's usually too far gone to be able to be helped. So I'm looking at about a full day to tear down and put back together the tank to get the fish out. The wrasse is the hardest since he hides in the aragonite. Could you help identify what the angel is afflicted with, and how I can treat it? I'd really hate to lose this new critter, it looks so nice (when it was healthy) and I also need to know what it is, since it's probably going to happen to all the other fish too. nitrates, nitrites, ammonia, phosphates all practically not measureable. Sorry for the long message, but I find its good to provide as much relevant information as I can. I appreciate your assistance, so will the critters I'm sure.